Rained on and beaten flat by wind and water. At the time I was doing a PhD on poetic Modernism, so my attention was focussed on the early years of the 20th century, on the impact of Yeats, the Georgians, the poetry of World War I, and the arrival of Eliot and Pound on the scene. As for contemporary British poetry of the 1950s, I had discovered two years earlier the poems of Philip Larkin and had been keenly interested and impressed; and now here was Hughes. I soon found him an alien temperament. In the back of the book I noted (as was my habit at the time, thinking always of how many poems and lines my own first collection might have to be) ‘41 poems, 974 lines’ – and put it aside. Larkin was more interesting among British contemporaries; and beyond work on the PhD, my keenest contemporary focus remained always on what was happening in New Zealand. But Hughes is such a large presence he is not one I could go on ignoring forever. Reading this Jonathan Bate biography I’ve felt again that I’ve been resisting Hughes most of my life. There’s an anxiety about this, a habit of critical conscientiousness learned when young, a feeling almost of guilt as if, as a serious reader of poetry, it’s my duty to have an opinion. This is slightly absurd; but these literary-critical questions are worth exploring – there’s usually something to be learned from them, if not about the poet then about oneself. The two books, his of 1957 and hers of 1963, seem to match one another, both with yellow and blue dust-jackets now, after almost sixty years, falling apart. Whereas my reaction to his poems had been one of failure (his or mine) to engage, with hers I felt the force of them, a sense that it was a raw force, rough, even rough-shod, with an edge of hysteria and self-dramatisation. The sense of immediacy was what was most striking, and that made Ted’s poems by comparison seem muffled. The alliance of Ted and Assia (David’s ‘lost diamond’) we now know went through many ups and downs until 1969 when she too killed herself. Sylvia in her suicide had taken special care that the gas did not reach the children asleep upstairs. Assia on the other hand took her and Ted’s little daughter Shura with her – curled up with her on the kitchen floor so they died together. When word of this got about, Ted, already in disfavour because of Sylvia’s death, and because of the way she seemed to present herself as his victim, became the object of a feminist vendetta which over the next two decades increased in volume and nastiness. He was reviled, his books stolen and savaged in bookshops, his house set on fire and archives damaged; he was hounded in public places and attacked at poetry readings as Plath’s murderer. Plath’s grave in Yorkshire, where Ted’s family came from, was attacked again and again and his name chiselled off the stone that identified her as ‘Sylvia Plath Hughes’. By now my own first book of poems had been published in New Zealand and my first critical book, The New Poetic, in the U.K. with a U.S. edition pending. Insofar as contemporary British poetry interested me, Auden, the senior figure, was still producing new work, and Larkin seemed the junior, weird and wounded perhaps, but a star. At least equally important, in America Robert Lowell and John Berryman were filling the frame. Lowell, whose Life Studies had so strongly influenced Plath, would soon be moving on to the liberation that his sequences of ‘open’ sonnets represented. I was conscious of new work by Hughes, but didn’t look closely until Crow (1970, dedicated ‘To Assia and Shura’), whose raw energy I tried hard to like and admire, but which made me wonder sometimes whether he was trying to match Ariel for impact. If he was, he was not succeeding. You can’t manufacture desperation on that scale. Only circumstances in combination with temperament can give it to you; and though Ted may well have had (indeed had created) the circumstances, his temperament was curiously British and unruffled. The wildness of Crow struck me as what the French call voulu – willed, trumped up, meretricious. A lumping sprawl, he tramples the bubbling mess. One shivers slightly looking up there. The writing is not perfect – the movement of the lines, especially the last, is slightly awkward. But in their tentativeness they seem truthful and don’t aspire beyond the level of the human and fallible. Craig Raine writes that ‘Ted had more charisma than anyone I’ve ever met’, and that he was ‘a spell-binding talker’. I never met him, nor Larkin either, so didn’t experience the ‘charisma’ of the one nor the reputed stammering insufficiency of the other. In the end, as always, it’s the poems on the page that matter – in Hughes’s case so many, and in Larkin’s so (relatively) few. 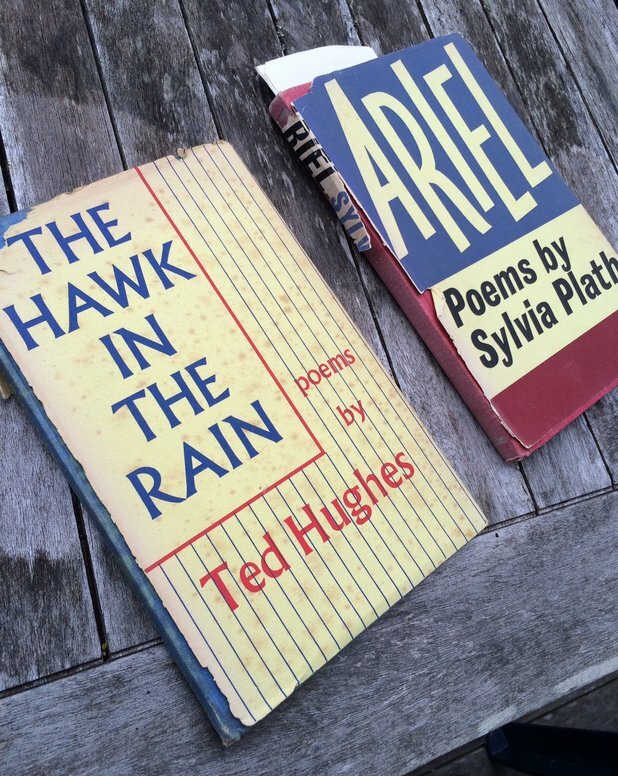 Two books; 'The Hawk In The Rain - poems by Ted Hughes' and 'ARIEL - Poems by Sylvia Plath'. Meanwhile the Plath dispute raged on, clouding the critical climate. Nothing said about Hughes as poet could seem to stand entirely separate from Plath; and Plath the poet was difficult to separate from Plath the ‘victim’ of Hughes. There were those who took Plath’s side, notably the British critic and Hampstead Ponds swimmer Al Alvarez; and those who took Hughes’s – including the American poet Anne Stevenson, despite the fact that she had been at College with Sylvia. And then there was Janet Malcolm who stood brilliantly between, striking a balance in her book The Silent Woman: Sylvia Plath and Ted Hughes. I once in the 1980s travelled in a tour bus at an academic conference with Anne Stevenson, who turned out to be deaf in one ear – so on the return journey I positioned myself on her hearing side and we had our previous conversation over again, filling the gaps. When I told this a few years later to Alvarez he said (of course) that Stevenson was deaf on the Plath side. A Soul is a wheel. The title poem of the collection had the sub-title ‘A Blessed, Devout Drench for the Christening of His Royal Highness Prince Harry.’ There was no irony here – this was serious right royal, loyal British stuff. But while the critics gasped, the wider public embraced him. If he was good enough for the Royals he was good enough for Britain. So now with confidence that many – probably the majority – were on side with him, he began to feel he could return to the subject of that first marriage and Sylvia Plath’s suicide. The result was the 1998 collection Birthday Letters in which he goes over that painful ground in memory. My feeling when I reviewed the collection in the New Zealand Listener was that it was as if we had all been hearing about, and even perhaps attending seminars on, the Hughes/Plath story for two or three decades, and that Hughes had been attending them too – but with the advantage that he had access to the diaries, his and hers, that had kept the record. The poems didn’t strike me as sharp new insights, but as pieces written by someone who knew what we all knew, but knew it better, and was versifying. I also had the memory of Verlaine having said, on reading Tennyson’s In Memoriam, written to commemorate the death of his friend Hallam, ‘When he should have been heartbroken he had many reminiscences’. There was good writing, it was accessible, human, sometimes touching, but lacking economy and the intensity economy brings; or perhaps that should be reversed – lacking the intensity that enforces economy. It was autobiography in verse, on a par with something like Louis MacNeice’s Autumn Journal of 1939, but without the historical interest. and reported that ‘Hughes gives his account of one of the century’s most celebrated and tragic love stories.’ All around the Anglophone world the news was that a great poet had ‘broken his silence’. Almost overnight the devil Hughes became Saint Ted, royal favourite and sad rememberer. The British poet Anthony Thwaite, who had just published his Selected Poems, complained that it received no public attention at all: ‘Taddeo Grande [Great Ted] has swept the board.’ Once again, and more dramatically even than usual, the ‘Faber poet’ sucked all the oxygen from the poetry scene and left it otherwise depleted. Bate acknowledges that critical (as distinct from journalistic) responses were mixed; but his own tone is reverent. He rates Hughes high among the English poets, alongside Wordsworth, sometimes with Shakespeare. One has to take this opinion seriously; but it seems to me there is little or nothing critical, analytical, detailed, to support it. He appears on the whole to be in the grip of a very English kind of nationalistic awe. So Sylvia figures in the end as both the cause of a major interruption to the career of a great poet; and yet at the same time, as the subject of his major work. Perhaps there is not a contradiction buried somewhere in this, but to me it feels as if there must be. And when Bate, seeming to follow hints from Hughes, suggests ‘his infidelity to others was a form of fidelity to [Plath]’, I felt there was something shabby either about the poet, or his biographer, or perhaps both. Not that sexual fidelity is a necessary moral principle; but to make it a principle observed by non observance seems devious in the extreme. I suppose Queen Victoria might have referred to Tennyson as ‘her poet and the incarnation of England’, but I doubt there is another precedent.